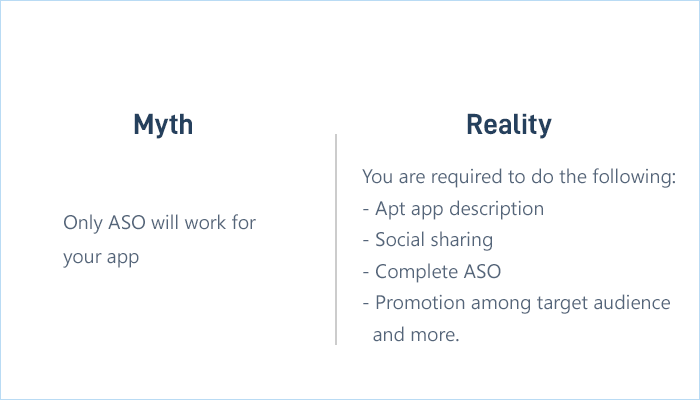 Read on to debunk some major app development myths! Mobile apps must be considered as an enterprise-wide strategy, but the mobile app development process is treated like a standalone project only. While planning and building mobile apps, businesses should take every decision critically. An app will help you connect your clients with your products or services. Nevertheless, there are some common mobile app development myths which de-motivate businesses from building their own mobile apps. There is always an excellent idea behind a successful business, and mobile app development is no different. If you are up to get your first app developed, make sure to carve out a unique and feasible idea that can be scalable and practical enough to be implemented. Every year, many people come up with fantastic app ideas in the various app growth conferences, but at the end of the year, a very few of them are able to make through the other side of the tunnel. Also, the idea should closely resonate with your mobile app budget because, with every type of app, the budget fluctuates. So, make sure to bridge the app idea and budget. It’s one of the top myths regarding app development. Some people think that mobile app development is all about writing codes; however, it is beyond that. Coding is a basic need to build Android and iOS apps, but there are many other factors a good app needs to cover, including graphics, user experience, high efficiency, and many years of experience. Developers should know the latest trends, technology, hardware, and updated tactics. You need different kinds of toolkits, languages, data sources and backend systems as every single case is different. Mobility is not just regarding app building; it needs a focused effort and a broader mobility technique to provide top-notch mobility solutions. Supporting different OS versions in the mobile space becomes different for the developers. This is why they prefer cloud-based mobile app platforms to make the process easy. Top-notch teamwork is needed to bring different stakeholders like business managers, project managers, in-house IT experts, developers, and management representatives on the same page and to make sure the entire app building procedure can be done precisely. With robust mobile app development frameworks and tools in hand, many of you must have this notion in your mind that building an app is just a simple juggling of the codes, but that’s not the case. The complete process of mobile app development involves multiple stages like UI/UX design, features listing, proper coding for all the platforms, beta testing, and more. Hence, with all these elements, it can even take a year to develop a well-performing app. Also, the scalability and app requirements play a significant role in deciding the overall complexity of the mobile app. Right after the app development, the app is all set to be listed in the app stores and to get a better ranking their, the best practices of the app store optimization should be followed. Technically, it will rank your app on top of the list. Interestingly, there is much more than the mere app store optimization. The way you display your app to the audience and how much your app relates to the description given below the app are also equally crucial for a better ranking. No matter whether a million people download your application, you can see only a few active users. If users visit your app on a regular basis, it can be considered a success. For instance, you have installed many apps on your mobile but you use only a few apps daily and others remain inactive on your phone. So millions of apps are of no use to you. As a result, if after downloading users don’t use your app regularly, it won’t become a hit. Yes, it’s true that the finest quality graphics are behind the success of your app building, but it doesn’t assure that millions of people will download it. Many things are responsible for an application’s success - incorporating clear performance, simplicity, user experience etc. These things ensure that you get the highest user rating. If your app’s purpose is not clear to your users, they will uninstall it due to confusion. Easy-to-use navigation: Users prefer apps which offer easy navigation; they don’t check whether it’s an eCommerce app or something else. They like apps which can be used easily with no navigation and tricky design. User interface: Mobile user interface design requirements are not the same as desktop computers. A mobile’s touch screen feature and tiny screen size are specific considerations in UI to ensure readability, consistency, and usability. User experience: If you want to enhance client satisfaction and reliability by improving ease of use and usability, go for the UX process. Therefore, it is evident that not just the app’s graphics but also UI and UX have a vital role in making your app development a hit. If you own app business, building a great looking and well-designed app doesn’t end your responsibility. Technically, you may have a flawless product, but if nobody knows about it except your team members, there is no use of it. Hence, what will you do? Just go for combining marketing tactics to use different channels. Without applying marketing tactics for mobile apps, you cannot achieve marketing success. Every business needs a smartly devised marketing plan, and with so many of platforms in the market, the cost of marketing tends to swell. But if the marketing is done on the right platforms with the right frequency, the overall cost of marketing can be cut down. Likewise, the mobile app marketing can also be covered in a budget if formulated astutely. There are various platforms where unpaid marketing can do wonders; therefore, it’s crucial to know well in advance what to brandish and where to market. Make sure to cover social media, review marketing, email, and other components while drafting the mobile app marketing strategy. At last, it’s about smart investments and returns. It’s 2019 already, and some users still believe that websites provide a better experience in comparison with mobile apps. 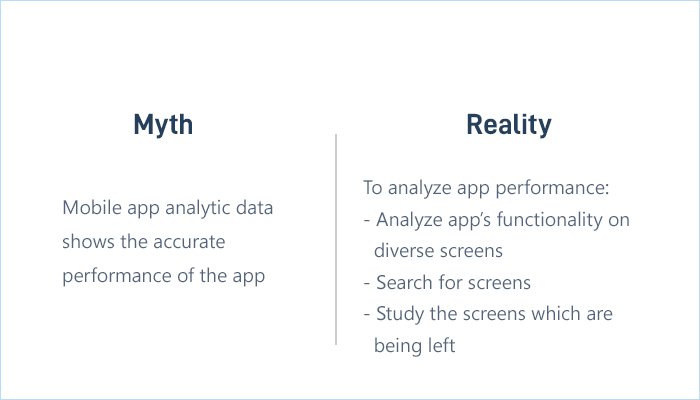 Nevertheless, statistics show something else, and it’s one of the most believed myths about app development. Statistics contradict this fact and say that back in 2016 every third person in the world was a mobile user. And by 2019 this number is anticipated to increase gradually up to 2/3rds or 67% of the whole population of the world. Mobile app users saw 286% more products online than mobile web shoppers. Moreover, the whole conversion rate is approx 120% higher on apps. 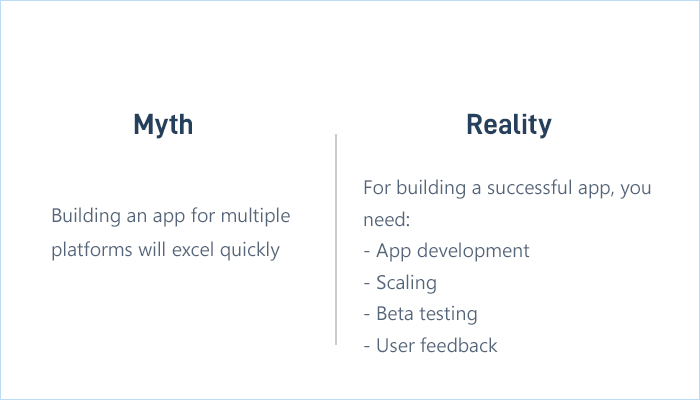 This myth about mobile app development is drawn because it’s challenging to compete with numbers. Considering mobile apps as a mini version of your website is the most common error. Some developers stuff more features into it when they want their app to offer a focused and particular performance to their target audience. If you think that you can get success with your mobile app in just one shot, you will end up with memory hogs, a slower performance and bloated app. You can opt for high-quality graphics, but enterprise users always search for ease of use and performance to get their tasks done. To deem your app a hit, focus on simplicity, usability, and most importantly an aimed object. Some people think that enterprise apps should have heavy data, putting extreme loads on the backend systems and devices. However, this is not true. Usually prime mobile platforms are known to take a massive amount of data from backend systems; nevertheless, they send just a fraction of it to the device. Developers require restricting the data size transfer for every app. Conventional tactics and processes of mobile app development take a lot of time. It takes almost six months to launch a new app to the App Store. Multiply the same figure by the number of apps needed for a business and an app technique becomes a non-starter even before arranging it. Albeit many creative and recent processes like rapid app building and feature-driven app building have allowed unique app deployment and development, declining the common myth of a lengthy app building procedure. Rapid app development is known for offering rapid results, and it is primarily objected to offering a development procedure with the help of development methods. There is no doubt that this process can improve the efficiency of the whole app development process. The latest cross-platform development processes also reduces development time. 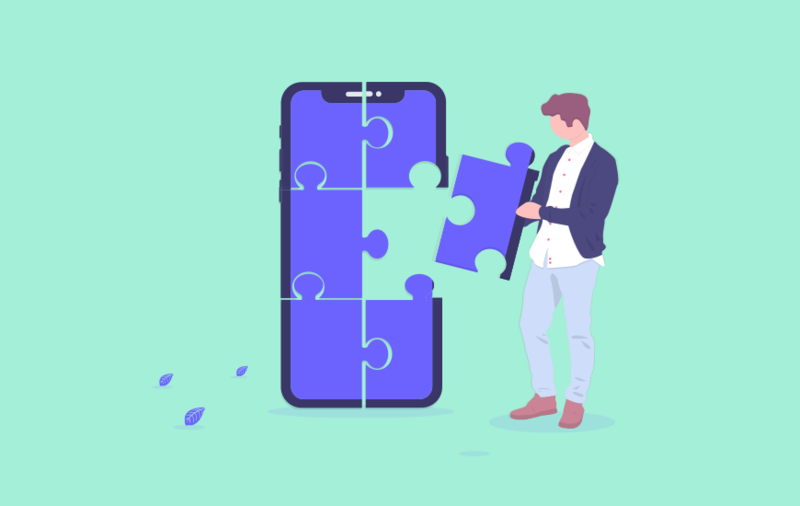 Now, cross-platform app building has lowered this by helping developers build mobile apps that are designed to be used on various mobile platforms. The latest app development platforms enable the developers to use any programming language and decrease the learning curve sharply. You can speed up app development using platforms like Xamarin by enabling you to code various app parts only once and use the code on diversified platforms again. The ready-to-use and easy-to-use cloud-based solutions like Nessus, SOASTA CloudTest, etc. have made developers’ lives easy for testing, hosting, and doing every essential job. Developing a cross-platform app is always a wise decision because it will save you time, effort, and money. For the same reason, most of the recent apps are crafted as a cross-platform app. But it doesn't mean that you can get the desired results in the very first try. By scaling the progress from scratch and weighing future opportunities, you can minimize the overall mobile app development time. The primary step is to jot down all the necessary app features, embed them in the app, and release the app for the best testing. Once all the bugs and glitches are taken down, you can proceed further to make your app flawless, or maybe add more functionalities. Thus, developing an app does take time! 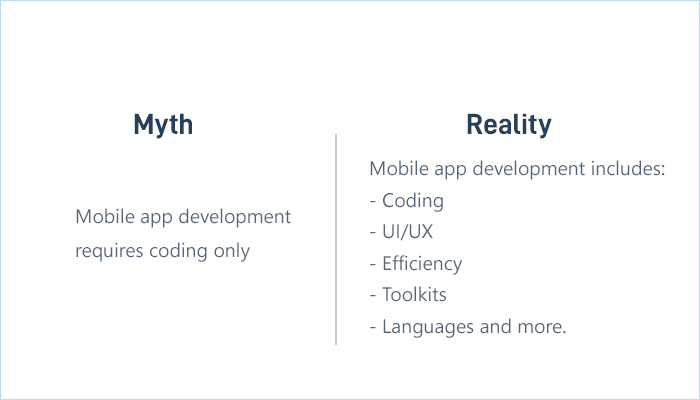 After discussing the aforementioned points, we can conclude that these are a few mobile app development myths which many people mostly believe. However, if you want to achieve success, you must not believe in these myths. Rather, concentrate on proven or examined processes for mobile app development. 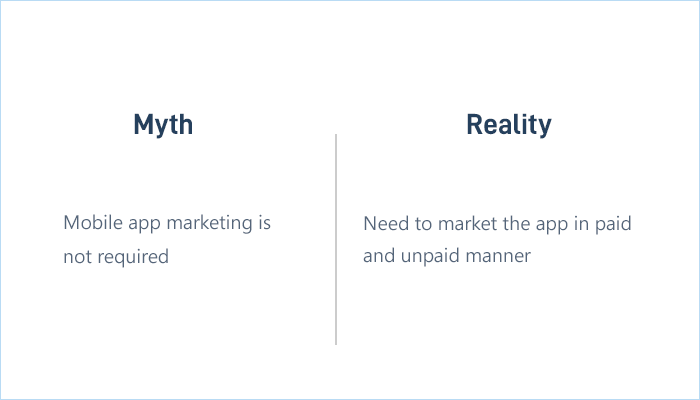 So, it’s important not to get interrupted by mobile app development myths like these and follow the right mobile app development practices to stay on track. In case you are seeking an app for your business, just get in touch with a renowned mobile app development company which has many years of experience in serving the mobile industry. For more such articles that provide valuable insights on the mobile app development, make sure to join the family of MobileAppDaily and stay updated with all the advancements of the mobile industry!